Meet Our Red River Hogs! 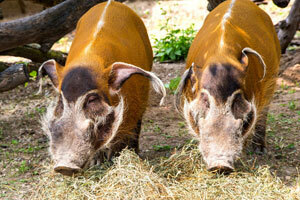 The Zoo welcomes its newest animal residents, 7-year-old red river hog brothers Mango and Radish. If you’ve never seen a red river hog before it’s definitely worth a Zoo visit, since their physical features are so unique. They have rust-colored, almost red hair, with a thin white stripe running down their back. If that’s not interesting enough, check out their face! They have white whisker tufts around their cheeks and white circles around their eyes. Almost feathery, white tufts extend off the ends of their ears. The top of their head is black. We acquired the siblings from the Charles Paddock Zoo in Atascadero, Calif. Although our keepers have not experimented yet, keepers from the Charles Paddock Zoo claim the hogs love the smell of perfume – the stinkier the better! Red river hogs are known for their sense of smell and are able to use their snouts to find food sources underground including roots, bugs or bulbs. Here at our Zoo, Mango and Radish are fed grain pellets, root vegetables (carrots, yams, sweet potatoes) and timothy hay. Visit the Zoo soon to see them before the Wisconsin winter blows in! Like many other hoofed animals, they cannot handle cold, icy, conditions. During Wisconsin’s coldest winter months, they will not be on public display while they stay in our special underground area called Winter Quarters. In the meantime, you can find Mango and Radish in their outdoor exhibit, located between the Elephant and Hippo Exhibits.